Potassium is a macro nutrient found in soils and foliage. 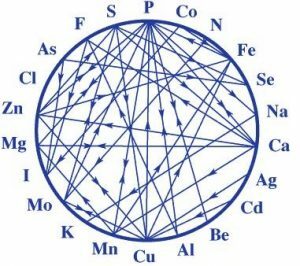 It also be combined to form a compound asa salt potassium chloride, potassium nitrate and so on or on its own as an ion. 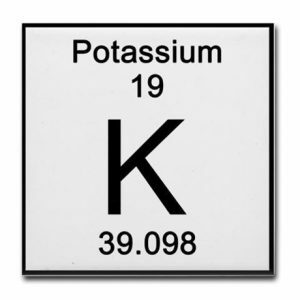 Potassium is a chemical element with symbol K and atomic number 19. It was first isolated from potash, the ashes of plants the dry elemental matter left when plant material is burned. In the periodic table, potassium is one of the alkali metals. Its name is derived from potash, So a paddock that has had the grain crop and stubble burned will be high in potassium. Some plants are potassium accumulators. Potassium is a mineral that the horse’s needs to work properly. It when a compound or salt it is a type of electrolyte. It helps the nerves to function and muscles to contract as well as maintaining a regular heartbeat. It also helps move nutrients into cells and waste products out of cells. It is has an essential part to play in maintaining the correct fluid balance inside and outside the cell via osmotic pressure. Potassium tends to be found in various crops and pastures so we need to be aware of which pastures and feed are high in potassium. Notably pastures of clover and rye. There are other sources which are covered in more detail later. This condition is closely tied in with calcium/magnesium imbalances. What happens when there is too much Potassium? Excess potassium interferes with calcium and magnesium absorption. Therefore what little magnesium ingested is sabotaged by the excess potassium. Rye Grass and Clover are naturally high in potassium, when fertilised with nitrogen, urea or superphosphate. Therefore during rapid growth plants accumulate potassium in their growth tips. 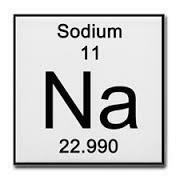 Sodium is concentrated on the outside of the cell. When a nerve or muscle is activated, potassium is ejected from the cell and the change in ionic balance sparks a bio-electical electrical impulse causing the brain (neuro) or nerve cell to react. Causes a contraction if it is a muscle cell. 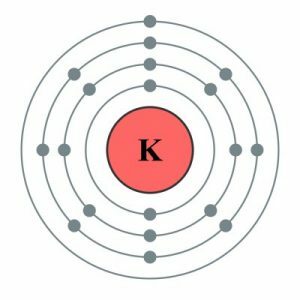 Potassium has a relaxing effect inside the cell. Magnesium has a relaxing effect outside the cell. A diet too high in potassium means that the extra cellular fluid is permanently high in potassium thus upsetting the sodium:potassium ratio which means the nerves and muscles cannot relax. Muscle rigidity Myotonia meaning ‘failure of the muscle to relax’ caused by this high potassium on the outside of the cells. Non photic headshaking due to ‘involuntary repeated firing of the trigeminal nerve in the head’. Laminitic attacks characterised by or preceded by myotonia and laboured breathing. Onset of grass flush during drought-breaking conditions. A lack of sodium (salt) reduces urination which affects the way the horse excretes excess potassium. May be found in the dry matter (but not in sufficient quantities in extracts) of the following: Ginseng, dandelion, nettle, sage, yarrow, rosehips, slippery elm, garlic, plantain, echinacea, chamomile, comfrey. Kelp is very high in potassium because Potassium hydroxide is used in the processing of seaweed. It breaks down all the fibre and is left as a residue of this process. Through supplementation via the horses vitamin, mineral and electrolyte supplements where you may double dose . Note Hyperkalemia is a potentially dangerous condition as it can cause severe heart arrhythmia, paralysis etc. So when you horse demonstrates any of the symptoms beyond mild, do not attempt to self medicate with just salt. Call the vet. Check that your vitamin and mineral supplement does not contain potassium, but also that it does contain sodium which is very necessary to help balance the high potassium intake. Look at supplementing with a magnesium supplement. Soaking hay reduces its potassium content by about 50%. The only time there would be a necessity for administering potassium would be when the horse is in work and sweating heavily. Hay still contains potassium in good quantities, so no need to worry if your horse is getting little or no grass, they’ll be getting the ‘right amount’ from good grass hay. 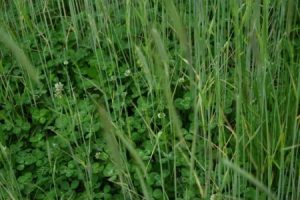 Start to look at changing the pasture mixes to include a range of grass and broad-leaf species. Reduce and or eliminate the use of glyphosates and /or feeds known to have been sprayed with Round Up or similar to hasten harvest times.